WHENCE COLOUR FLOURISHED -- ON YOURS FLOWERS! The local stories and legends added Hardoi to many incidents and persons in ancient history. a water source named fame as BrahmaVert at bank of Dahar lake in Adampur near Sandi. It is said that the master of universe, Brahma, rested here during his initial pilgrimage. These traditions and people's saying are in fame that the city, Hardoi, had been established by the demon king, Hiranyakashyap who was against the God. Consequently the place was well known as 'Haridrohi' which is now Hardoi. The festival of colours is going to celebrate by Hindu community on March 23rd. The festival is the indicator of truth victory on evil. The sister of Hiranyakashipu, Holika, had a sari was blessed by lord Narad that the sari would never burn in fire. Holika had an idea she would never burn if she sat having worn the blessed sari in fire. Hiranyakashipu was puzzled with the activities of his son, Prahlad who used to sing the glory of god sri Vishnu. Hiranyakashipu was in boast of his prowess and felt himself the winner of universe. He wanted his son should not respect god Vishnu. Prahlad was in his childhood. 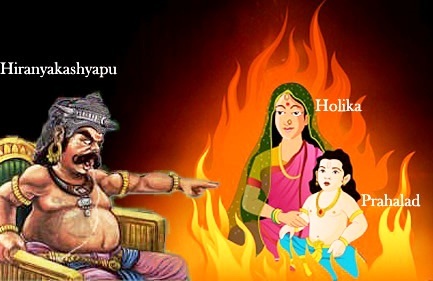 His aunt Holika (father’s sister) told her brother that if she took him in her lap and sit on pyre, she would remain safe in fire and Prahlad would burn to ashes. Her advice was feasible to her brother so he gave his tacit acceptance to perform the trick. Holika wore the sari which was blessed not to burn in fire. She took child Prahlad in her lap and sat in pyre. Prahlad was continue to chant the name god Vishnu. The sari and Prahlad was safe and Holika was burn to ashes. The people seeing the supernatural power of God to safe Prahlad’s dedication celebrated as Holi festival. Even today, people enact the scene of 'Holika's burning to ashes' every year to mark the victory of good over evil. In several states of India, specially in the north, effigies of Holika are burnt in the huge bonfires that are lit. There is even a practice of hurling cow dungs into the fire and shouting obscenities at it as if at Holika. Then everywhere one hears shouts of 'Holi-hai! Holi-hai!'. The tradition of burning 'Holika' is religiously followed in Gujarat and Orissa also. Here, people render their gratitude to Agni, the god of fire by offering gram and stalks from the harvest with all humility.